There's already controversy swirling around Splice, the tale of a dangerous genetic experiment who looks like a beautiful woman. Directed by the indie auteur behind Cube, Vincenzo Natali, the movie is deliberately disturbing. And it tells a brutal psychological truth. Reactions to Splice have been strongly divided: Critics either dismiss it as gore-soaked exploitation, or hail it as the latest work of art from a director whose resume already includes harrowing mindbenders like Cube and a forthcoming adaptation of William Gibson's Neuromancer. Why all the fuss? There's a slimy, Cronenberg-esque aesthetic at work in this story of two genetic engineers, Clive (Adrien Brody) and Elsa (Sarah Polley), who decide to splice a human genome with DNA from a hodgepodge of other animals. The result - which emerges in a gush of amniotic fluid from a tank - is a chittering human-animal creature with preternatural intelligence and a poison-tipped tail. Natali isn't interested in telling us a typical mad science tale, where the results of a shady experiment turn out evil and run around eating people or whatever. Cleverly, creepily, he turns this generic story on its head, exploring the oblivious cruelty of the scientists who made the creature they name Dren (yes - it's nerd spelled backwards). Their company is in the business of cranking out designer organisms that manufacture proteins that can be used in various products, especially the dairy industry. And their hope is that Dren's body will make proteins that could aid with cancer cures that would make them ridiculously rich. Plus, Elsa has secretly always wanted to have a baby. You see where this is going, don't you? Splice is a story about the immoral edges of science, but also and more profoundly about the immoral edges of family life. Dren is both a valuable experiment and a child, and Elsa's confusion over the creature's status offers us a deeply upsetting vision of child abuse. In a series of flashbacks, we learn that Elsa herself was treated like a lab animal by her mother, and as a result she's left psychologically broken - unable to distinguish between her role as scientist and mother to a vulnerable, all-too-human creature. As Elsa, Polley is amazing: She perfectly conveys the geek intensity of a scientist focused on her amazing discovery, as well as a woman suffering from a terrible childhood. Brody also delivers an appropriately neurotic, whiny performance as her less-talented sidekick. 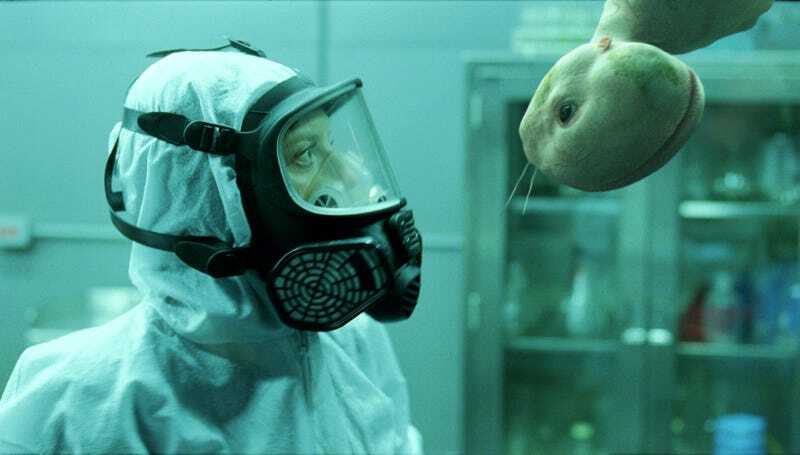 There's a scene about halfway through Splice that perfectly captures the difficult line this film has to walk, teetering between a story about science and family. Elsa and Clive have had to hide the now-fully-grown Dren in Elsa's childhood home, an old farmhouse in the woods. They lock her into a barn all alone, with nothing to do but wait for their sporadic visits. Bored and lonely, Dren befriends a cat and cuddles with it at night. When Elsa discovers the cat, she takes it away from weeping Dren, admonishing her that it could be dangerous. Utterly alone, Dren curls up in her straw bed, crying and frustrated. At last Elsa realizes that she's been cruel, and tries to give the cat back to Dren - but Dren, in a fit of wrath, murders the cat with her poison tail. It's a classic scene of child abuse, where cruelty is passed down from more powerful creatures to the less powerful. And it's completely, utterly horrifying. There are some unfortunate stumbles in the film too. For every moment like the emotionally intense cat scene, there are others that deliver pointless squick. While the agonized love between Elsa and "daughter" Dren feels raw and true, the sexual tension that develops between Dren and Clive is clunky. Dren naked, with all her animal parts showing, is certainly a special effects marvel - she truly does look alien and beautiful. But it's easy to see why some viewers will be put off by this subplot. Where the movie succeeds - and I think it does succeed, overwhelmingly - is in drawing you into an emotional relationship with its characters. Flawed, brilliant, and realistic, Elsa invites us to look at both motherhood and science without airbrushing. Creating life isn't a selfless act, and Splice unflinchingly shows us all the reasons why. It's not a pretty sight. But it's worth looking - if you dare.